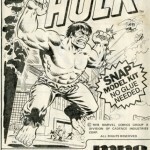 You are currently browsing the Collector Model blog archives for January, 2012. A lot of our development team’s time is spent on our product packaging. It is a key marketing and sales tool and in some cases, it makes the kit much more desirable. If you read our blog regularly, you are probably familiar enough with our products to know what to expect from us in this regard. I figured I would show you some of the steps we go through and what we encounter as we work. 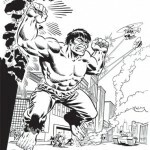 For this example, I’ll be using our upcoming release of the Incredible Hulk. 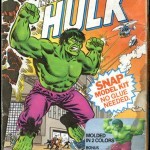 In the case of this kit we started with what we had, a tattered copy of the kit released in 1978. The plan was to ditch the old packaging style completely and shift it more towards an Aurora style long box but keep a modern sensibility about it. 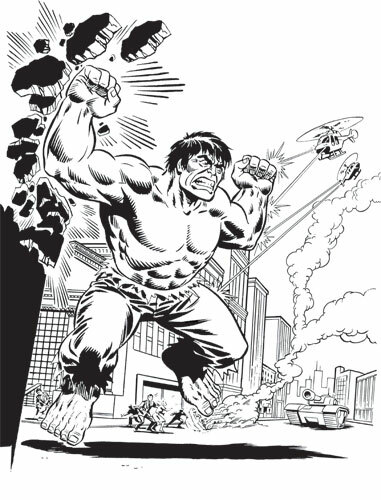 Comparing the proportion of the art board to the long box style, I found we could center more in on Hulk and let the rest of the scene actually wrap around one side of the box to give the effect of “okay, here is the Hulk. He is mad” then as you turn to the side of the box, you get the reveal of “oh, this is what he is mad about”. In order to start, the old box featured a giant violator that covered a major part of the background. 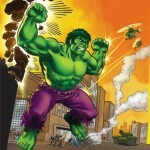 An image of the buildup cut into Hulk’s knee. All of this is besides the fact that our box is nice and worn with plenty of cracks and stains in the image. 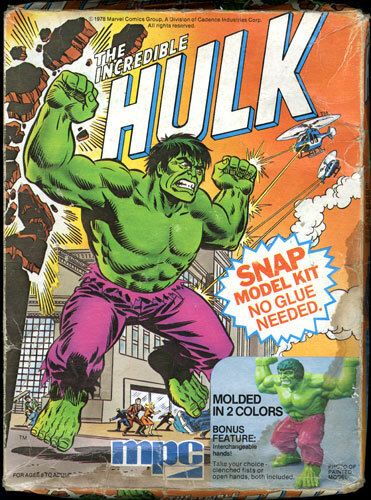 The decision was made to break it down to just the line art and recolor it as I had done on the Spider-man and Captain America kits. This would give it the updated look I mentioned. The instruction sheet featured the same line art in pure black and white so I figured this would be a great head start. The problem was that the art on the instructions did not perfectly match the box lid. It wasn’t a complete redrawing but a few embellishments had been made to the artwork. A few lines were thicker here or there. Once I broke it all down and mixed and matched the parts of the line art I wanted from the two illustrations, I set to filling in the gaps created by the violators. The only clue I had to the contents were an overturned car and smoke coming from it and who knows what else. There were also a few building tops peaking up from the behind the legal line on the instruction sheet. I found the look of the TV news style helicopters to be a little ridiculous and decided to embrace that a little bit. 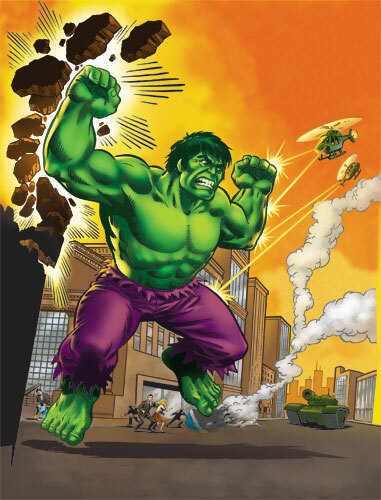 I decided to shift their color scheme to a more military look and drew in one of General Ross’ “Hulk-buster” tank on the ground to give him something to really get angry about. Filling in the rest of the cityscape background was logical to complete the rest of the scene. 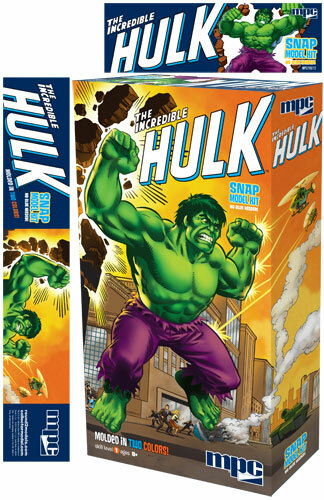 So here it is, a sneak peak at the upcoming Incredible Hulk packaging. 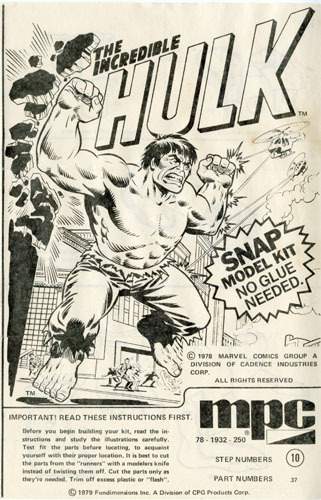 (All images are currently under licenor review and are subject to change) we will feature a build along article by Mark McGovern covering both the MPC Incredible Hulk and Spider-man kits on our website when we approach the release dates. Polar Lights Model Kits: Be Careful What You Wish For. Jamie – It’s been 6 weeks since there was anything new here. Can you tell us what you got for Christmas? 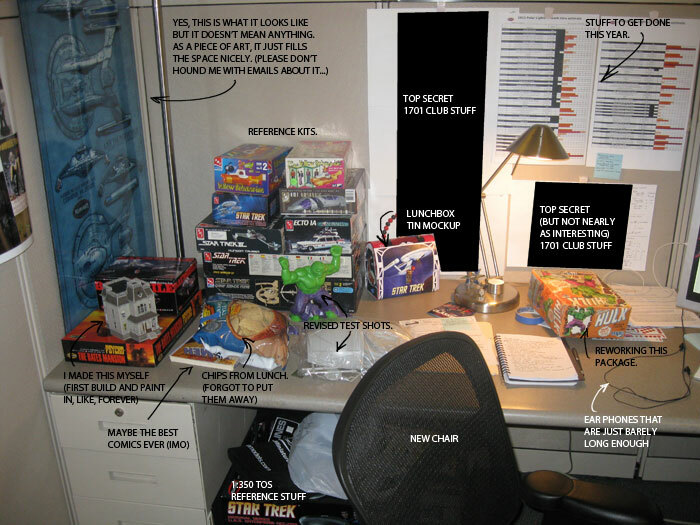 Screen shot of your work desk? Throw us a bone, please! I had just been saying I needed to do a new blog post. How could I deny a request like that? 6 weeks? I’ve got no excuses other than the usual… Just been busy. Can’t help that. Anyway, here I am now. I’ll figure out something more substantial to write about soon but I’m going to fulfill that request with this post. For Christmas, I mostly received books and movies. Generally through the year I don’t buy much for myself other than a monthly batch of comics so usually by Christmas I have to go through the painful process of determining my wish list. My wife and family usually do right by me. This year, I got the following Blurays- Sucker Punch (still don’t get what people don’t like about it. It has everything a 3 year old boy should be looking for in a flick), Inception, Limitless, Alien box set, The Matrix, Goodfellas, Independence Day (apparently the worst movie I personally enjoy) and 300. I got books by and about Syd Mead, Raymond Loewy, Andrew Loomis, Alien Vault, making of Blade Runner, 41 American illustrators, an overview of the top fashion illustrators, and a novel length comic named, Habibi. I got an awesome looking Gundam kit. I can’t remember his name but he’s got a Gatling gun and rocket pack. I’m sure there was much more. 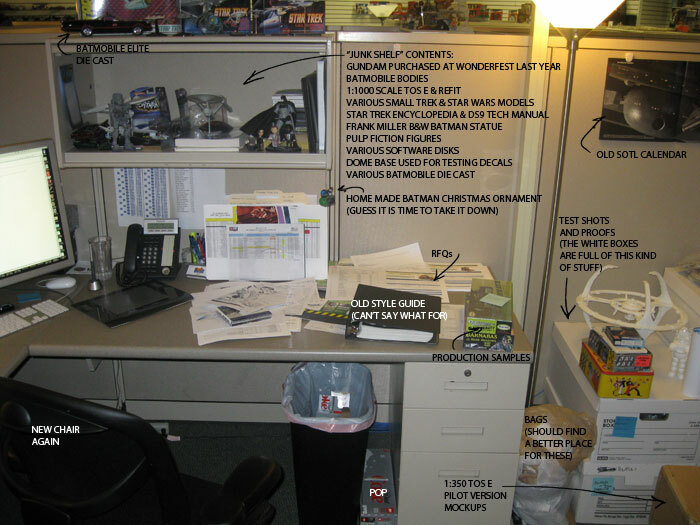 You should see photos of my desk in its current state. I’ve thrown in some descriptions of what you see there. It is usually not as exciting as it might seem. 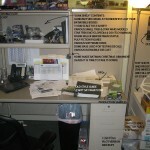 I have a medium amount of clutter today. I’ve covered anything referring to the 1:350 TOS Enterprise to keep that between the 1701 Club members and me. Btw, The club is filling up. We have right around 200 spots left. Join now if you have been debating whether or not to dive in. 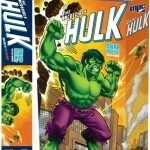 You will see a copy of the MPC Incredible Hulk kit on my desk. 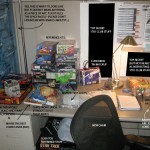 If you happen to won a copy of the MPC Spider-man kit and happen to have the instructions for it. Let me know if you are interested in lending them to us for a little while in exchange for a few kits. That kit is hard to find. If you look close, you may find some clues or “bones” to upcoming product.